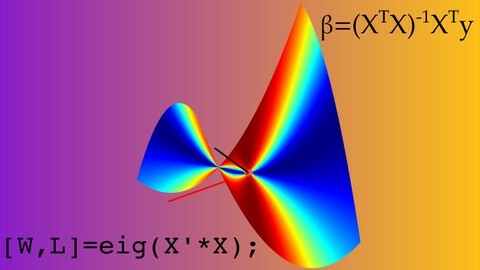 Learn concepts in linear algebra and matrix analysis, and implement them in MATLAB and Python. Ace your linear algebra exam! Interest in learning about matrices and vectors! You need to learn linear algebra! Linear algebra is perhaps the most important branch of mathematics for computational sciences, including machine learning, AI, data science, statistics, simulations, computer graphics, multivariate analyses, matrix decompositions, and so on. You need to know applied linear algebra, not just abstract linear algebra! The way linear algebra is presented in 30-year-old textbooks is different from how professionals use linear algebra in computers to solve real-world applications. For example, the “determinant” of a matrix is important for linear algebra theory, but should you actually use the determinant in practical applications? The answer may surprise you, and it’s in this course! If you are interested in learning the mathematical concepts linear algebra and matrix analysis, but also want to apply those concepts to data analyses on computers, then this course is for you! Clear and comprehensible explanations of concepts and theories in linear algebra. Several distinct explanations of the same ideas, which is a proven technique for learning. Visualization using graphs, numbers, and spaces that strengthens the geometric intuition of linear algebra. Implementations in MATLAB and Python. Com’on, in the real world, you never solve math problems by hand! You need to know how to implement math in software! Beginning to intermediate topics, including vectors, matrix multiplications, least-squares projections, eigendecomposition, and singular-value decomposition. Strong focus on modern applications-oriented aspects of linear algebra and matrix analysis. Intuitive visual explanations of diagonalization, eigenvalues and eigenvectors, and singular value decomposition. Understand statistics including least-squares, regression, and multivariate analyses. Improve simulations in engineering, computational biology, finance, and physics. Understand data compression and dimension-reduction (PCA, SVD, eigendecomposition). Understand the math underlying machine learning and linear classification algorithms. Explore the link between linear algebra, matrices, and geometry. I have been using linear algebra extensively in my research and teaching (primarily in MATLAB) for many years. I have written several textbooks about data analysis, programming, and statistics, that rely extensively on concepts in linear algebra. Watch the course introductory video and free sample videos to learn more about the contents of this course and about my teaching style. If you are unsure if this course is right for you and want to learn more, feel free to contact with me questions before you sign up. I hope to see you soon in the course! Someone who wants to learn about eigendecomposition, diagonalization, and singular value decomposition!